How to Not Catch Dogfish – Ya Like Dags? Even the biggest fan of spiny dogfish can’t deny that these little sharks sure are great at choking up entire nets. This is especially problematic for commercial fishermen who are trying to catch anything other than dogfish, and particularly for fishermen targeting silver hake, one of the few groundfish doing well up in New England waters. Silver hake are present in huge numbers in Massachusetts Bay, but are often associated with large schools of dogfish. Landing dogfish as bycatch counts against the quota for the little sharks, and quotas are still rather low as NMFS determines the extent to which the stock has recovered. Also, most silver hake fishermen would much rather just have large, dogfish-free catches of their target species. So how can fishermen get around the dogfish and still land a decent amount of hake? Technology, baby! Researchers from the Massachusetts Division of Marine Fisheries worked with a commercial trawler to gauge the effectiveness of a dogfish excluder device (they don’t call it that in the paper, but I think “DED” has a nice ring to it) on a silver hake trawl. In concept, it works exactly like the TEDs familiar to commercial trawlers. The setup for the dogfish excluder. From Chosid et al. (2011). 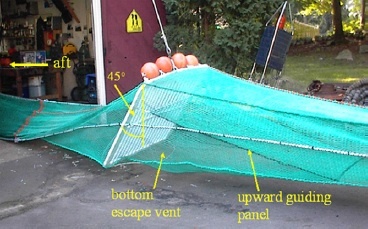 The basic idea is that all the fish are guided up towards the top of the net by the guiding panel, and then smaller fish like silver hake and Atlantic herring pass through the grate while dogfish slide down it and through the escape vent in bottom of the net. So how well does this work? To find out, the Mass DMF researchers not only counted everything landed by the trawl, but also mounted cameras on the net to observe the number of fish passing through and record their behavior as they worked their way through (or, hopefully in the case of dogfish, not through) the grate. They experimented with two different angles (45° and 35°) and made their experimental tows during the normal silver hake season, varying the color of the grate as well. Overall, the experimental net caught very few dogfish and large amounts of both silver hake and Atlantic herring. Though the color of the grate did not seem to matter, the 45° angle seemed to perform better at catching the target species. The vast majority of fish observed escaping through the vent were in fact dogfish, and only in four tows did dogfish occur in large enough numbers to effectively clog the grate. Overall 88% of the dogfish that entered the net escaped through the vent. Though other excluder devices have been shown to be ineffective at reducing dogfish bycatch, the device used in this particular study was quite effective, which the authors chalked up to the 50 mm width for the grid of the excluder grate. This seemed to be sufficient to prevent dogfish from getting stuck while still allowing the much smaller and thinner silver hake to pass through. Some interesting results were found from the video footage. Dogfish performed a variety of behaviors upon exiting the net, but my own personal interest in these little sharks as predators was piqued by the fact that all other captured species exhibited noticeably more erratic swimming behavior in the presence of dogfish. Apparently even when caught in a trawl there’s still time to be afraid of being eaten. The only issue I have with this study is the lack of a control trawl without the excluder device, which is actually addressed by the authors. The fishermen taking part in this study reported that the reduced handling time from not having to deal with as many dogfish alone was worth installing the device. I’d still be interested to see if the amount of silver hake caught is significantly different from a non-excluder trawl, and I imagine most hake fishermen would be too. Still these are great results for a method that can hopefully be modified to fit other trawl fisheries. Hey Chuck…interesting post here. Lots of potential with this one, although the gates would have to be designed with the target species in mind (to accomodate different body shapes), but I think that this is doable.